The RD-180 is a two thrust chamber derivative of the RD-170. It packages the high performance, operability, and reusability features of the RD-170 in a size (933,400 lb thrust) to meet U.S. booster propulsion needs. The RD-180 is a total propulsion unit with hydraulics for control valve actuation and thrust vector gimbaling, pneumatics for valve actuation and system purging, and a thrust frame to distribute loads, all self contained as part of the engine. The engine, employing a LOX lead start, staged combustion cycle and LOX rich turbine drive, delivers a 10 percent performance increase over current operational U.S. booster engines and provide clean reusable operation. Lockheed Martin has selected the RD-180 engine to provide the booster propulsion for its Atlas 3 launch vehicle and its candidate for the U.S. Air Force's Evolved Expendable Launch Vehicle (EELV). 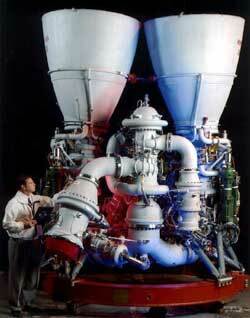 The RD-180 is a staged combustion cycle engine that burns liquid oxygen and kerosene propellants. The two thrust chambers can gimbal +-8 degrees. The engine has a health monitoring and life prediction system. Minimized interfaces are needed with launch pad and vehicle (pneumatic and hydraulic systems self contained, electrical panels consolidated, thrust frame to simplify mechanical interface). The engine offers environmentally clean operations with staged combustion oxidizer rich preburner, and oxidizer start and shutdown modes that eliminate coking and unburned kerosene pollution potential. Forty to 100 percent continuous throttling provides potential for real time trajectory matching and engine checkout on the pad before launch commit. Eutelsat W4 - Description of the satellite to be launched on AC-201.